With just a light touch of your wrist or the back of your hand on the spout or tap body you can activate the GROHE Minta Touch kitchen tap – keeping it sparkling clean even when your hands are covered in dough. For extra safety – and to protect your children against scalding – cold water flows whenever the tap is activated by touch. That means this stylish tap is wonderfully easy to use and perfectly child friendly. The elegant GROHE Minta Touch tap comes with a handy pull-down spray head for greater freedom of movement and has a sophisticated GROHE SuperSteel coating that is extraordinarily scratch resistant and hygienic. Looking for a highlight to add to your kitchen? 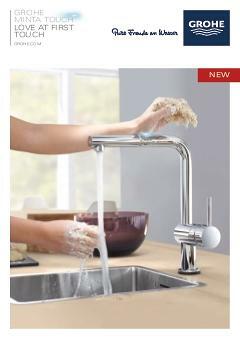 The Minta Touch tap blends functional performance with an attractive design.